Interested in joining St. Andrew’s? Here are the steps to becoming a member of our parish family. We invite you to join us at one of our three weekend services, each with a distinct style of worship. All three services feature Bible-based messages, vibrant Anglican liturgy and Holy Communion. Once a quarter we invite newcomers to attend “Breakfast with the Priest,” an informal gathering between services on a Sunday morning. Here you’ll have an opportunity to meet Fr. Ron Baird, our rector (senior pastor) and some of our other staff, ask any questions you may have about our church, and learn a little bit about the mission and ministry of St. Andrew’s and how you can get connected here. When you attend “Breakfast with the Priest” we’ll invite you to formally join our parish family by signing a covenant of membership, and completing a parish profile. This signals your intention to join St. Andrew’s and follow some simple Biblical principles of membership in the Body of Christ, and gives us the information we need to establish your record of membership, such as contact information and information about you and family members who are joining with you, including birth date, baptismal and confirmation dates, and date of marriage. We understand if you’re not yet ready to join the parish after attending “Breakfast with the Priest.” Your continued presence with us in worship and other activities is welcome, regardless of whether you choose to join the parish. You may join the church at any time after “Breakfast with the Priest” simply by returning a completed parish profile. Holy Communion @ 5 p.m..
Who should attend "Breakfast with the Priest?" Anyone who is interested in joining St. Andrew’s, or just wants to know more about our mission and ministry! I've been Anglican/Episcopalian all my life. Do I still need to attend the newcomer's breakfast? If you want to join St. Andrew’s, yes! 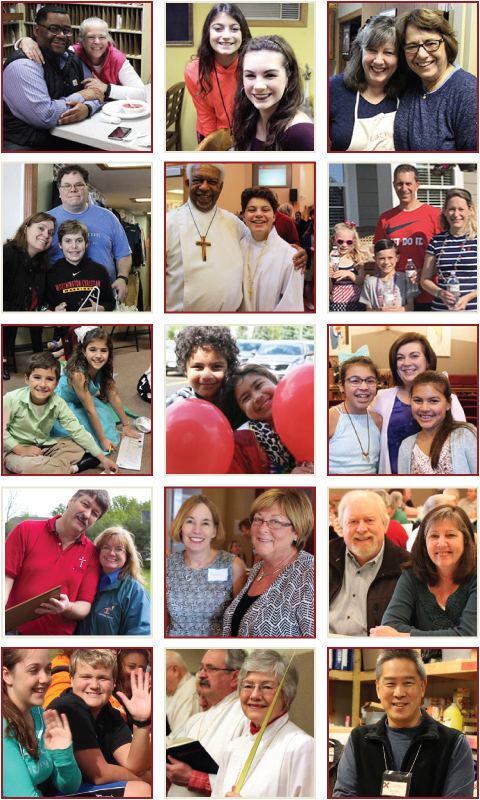 We think it’s important to know a little bit about who we are before you join our parish family. We focus at the breakfast more on the mission and ministry of St. Andrew’s than on the Anglican faith tradition. I’ve been coming to St. Andrew’s for awhile now. Do I still need to attend the breakfast? We welcome your presence with us in worship and other activities, regardless of whether you’ve made a formal commitment to membership at St. Andrew’s. We believe, however, that there are some important reasons to make a commitment to a local church community, and we hope that taking the time to get to know us a little better will help you decide if that is something you’d like to do. Making a formal commitment to membership also makes you eligible to vote in parish elections and serve in positions of parish leadership. If I come to the breakfast, am I obligated to join the parish? Although you will be invited to join St. Andrew’s, you are under no obligation to do so. Once you complete the class, you may join the parish at any time simply by completing the parish profile that is in the membership materials you will receive, and returning it along with the membership covenant that’s included. I'd like to have my child baptized at St. Andrew’s. Do I need to be a member? of this parish. We believe it’s important that the parents be members too, since they are covenanting to raise the child in the faith. How do I arrange for Baptism? Baptism, the sacrament by which God adopts us as his children and makes us members of Christ’s Body, the Church, is offered on the first Sunday of every month and on various special occasions. If you desire baptism for you or your child, please see Fr. Ron, or call the church office to request an application for Baptism. How do I arrange for Marriage? The Sacrament of Holy Matrimony, the union of a woman and man in Christian marriage, is available to couples who are members of St. Andrew’s. If you are considering marriage, first contact Fr. Ron or Fr. Shane to arrange for marriage preparation, and then call the church office at 740-548-5112 to schedule a date for the wedding. We are members of the household of God! Christ is committed to his Church; 0ur commitment is in obedience to Jesus. Membership in the church is an antidote to the consumerism and lack of commitment in today’s society. Commitment builds character. Membership identifies who is in our family, and defines who can be counted on. God’s purposes for your life are the same purposes for which he established the church. All human beings have a basic need to belong, and at St. Andrew’s, we meet that need through membership in the body of Christ. We all have a need to be accepted for who we are, and as you become assimilated into the life of the church, you will begin to develop the relationships that will bring you joy and sustain you in times of sorrow. We also,have a need to be competent, and in the M.A.D.E. process you will be given the tools you need to feel competent in your walk with Christ. We, in like manner, have a need to contribute; as you are equipped for ministry and begin serving Christ in the church and world, you will begin to live fully the purposes for your life.